They just keep putting out amazing stuff — and, tamam, even when it’s not amazing, it’s stuff no one else does… Cool article on the legendary Athenian neighborhood, my first choice if I had to live there. Athens’ Exarchia neighbourhood has preserved the memory of decades of resistance to state repression. Situated in the centre of the city, right next to the “historic triangle” of Syntagma parliament building, Monastiraki (under the Acropolis) and Omonoia Square, Exarchia is considerably unpolished compared to its neighbours to the south and east. But what it lacks in clean sidewalks, it makes up for in virility and spirit. After the restoration of democracy in 1974, Exarchia became home to the emerging left-wing movements, anarchist collectives, intellectuals, activists and, notoriously, urban guerrilla terrorist groups like “November 17”, which came straight out of the Exarchia far-left. 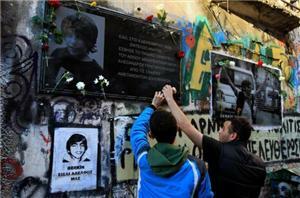 This year’s commemoration of his death on December 6 turned into clashes with the police. Yet again, the police forces brutally attacked the relatively peaceful demonstration running through downtown Athens, and yet again, Exarchia became the stage of a well-known war game between the angry youth and the police. The way protests happen in Exarchia, however, is a bit different. The streets, the buildings, the residents are not just passive spectators of this extended war. In December, the whole neighbourhood was “up in arms” throwing flowerpots and furniture from their balconies at the riot police; Molotov cocktails were raining down on the police from rooftops. The neighbourhood also showed solidarity with the hunger strike of Nikos Romanos, Grigoropoulos’ best friend, who is now in prison. Tension quickly escalated and on December 3, a group of anarchists attacked the PASOK headquarters with 30 molotov bombs. As the police chased them down Messologiou Street, a group took refuge in the bar where I was sitting. They took off their masks and sat around pretending they were customers. They seemed angry, high on adrenaline and I could tell by their faces that the feud with the police and the state will not be settled any time soon. In the corner of Navarinou and Zoodochou Pigis street, a tiny park breaks the grey urban mass that is Exarchia. This once empty lot was meant to be turned into a parking lot, but activists took it over and after years of bitter struggle, managed to bring it under communal control and turned it into a green oasis, with a playground and a garden. “Their parking, our park” is the slogan of the group that runs it, and it’s the perfect metaphor for what the lively neighbourhood wants to be.